The Royal Palace of Aranjuez (Spanish: Palacio Real de Aranjuez) is one of the places the King of Spain lives. 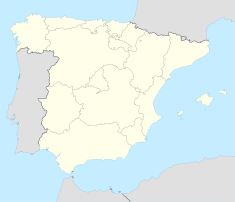 It is located in the town of Aranjuez, Community of Madrid, Spain. The palace is open to the public as one of the Spanish royal sites. It was originally the site of a medieval hunting lodge. Philip II built it as a modest summer palace. The palace was designed by Juan Bautista de Toledo and Juan de Herrera who also designed El Escorial. Later kings kept adding to it. It was completed during the reign of Ferdinand VI in the mid-18th century. Charles III added two wings to it. By that time the palace had over 300 rooms. The Royal Palace of Aranjuez was one of 100 finalists for the 12 Treasures of Spain in 2007. This page was last changed on 26 July 2018, at 06:00.